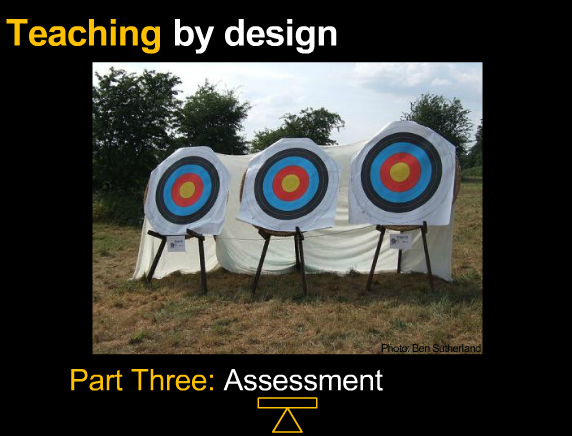 Part 3 of the Teaching by Design series examines assessments, both the formal, graded assessments (exams, papers, projects) that determine the students’ grades, as well as informal, ungraded assessments, also known as Classroom Assessment Techniques (http://www.ntlf.com/html/lib/bib/assess.htm). While formal, graded assessments are a part of every course, classroom assessment techniques or CATs, are an often overlooked but no less important aspect of teaching and learning. Designed to provide feedback on how what students know and how well they know it, CATs ensure that students are on the right track before they write their papers, take their exams or complete their projects. That way, you (and your students) can make adjustments in the teaching and learning process before it’s too late. Part 3 also reviews two key questions to consider when designing assignments and what some have called “authentic” assessment, assessments that ask students to demonstrate and “perform” their knowledge in a relevant, real-life context, which can help to increase student motivation. I give two examples of “traditional” assessments that have been revised into authentic ones. Because many instructors often focus on teaching, assessment is an often an afterthought – addressed typically just before a formal assignment is due. Thinking about assessment before you teach and throughout your course will enable you to be a more effective teacher and your students to be more effective learners. For assistance in this process, there are links to resources about authentic assignments (z.umn.edu/aassessments) and Classroom Assessment Techniques (z.umn.edu/whatisacat). You’ll find the PDF conveying the Authentic Assessments: Sparks for Effective Learning narrated presentation in the Teaching by Design section.